Hooks are all the rage in React, especially now that they are stable as of React v16.8! The Hooks Proposal is an attempt to address several major concerns developers have with React. Essentially, a Hook is a special function that allows you to “hook into” React features. Hooks are ideal if you’ve previously written a functional component and realized that you need to add state to it. If you’re new to Hooks and would like an overview, check out our introduction to React Hooks. In this tutorial, we’re going to take a previously written class-based component and convert it into a functional component using the useState Hook. Simply put, useState declares a state variable to preserve values between function calls. The variables are preserved by React. useState only takes one argument that initializes the value of the state that you’re setting. By implementing useState we no longer need this.whatever, we can access the variable directly. To help speed things along, we’ve prepared some starter code. In the starter code, we installed the latest version of react and react-dom as well as reactstrap to help us have some easy formatting. 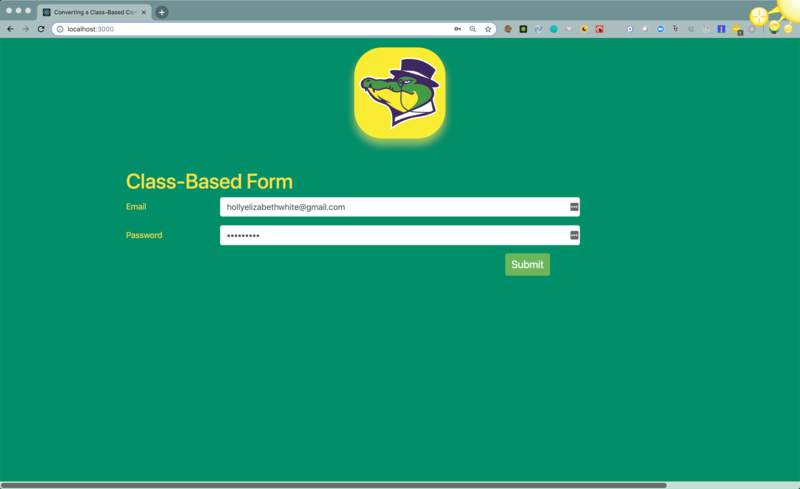 First let’s take a look at the current ClassBasedForm.js component located in the components folder. If you work with React frequently, this should all look pretty standard. Now let’s convert it to a functional component using the useState Hook. First, create an additional Form component in the components folder. 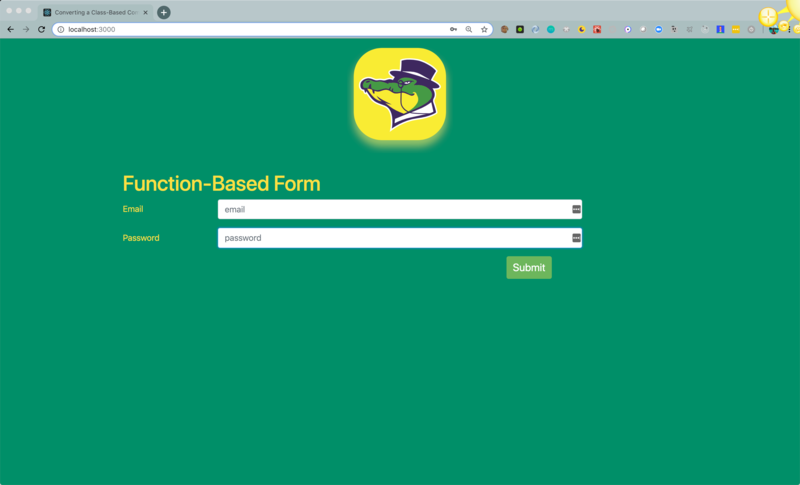 Title it FunctionBasedForm.js. We’ll use this component to build an identical form using the useState Hook. Having the two components side by side will allow you to toggle and easily identify differences. We’ll first import React and create a simple function variable called FunctionBasedForm that returns some text. Be sure to export this function. Flip over to your App.js file and import your new component. For now, just comment out the previous ClassBasedForm import. Replace your previous component with your new <FunctionBasedForm /> component in the return statement. Let&apos;s take a look at localhost:3000 in the browser to be sure we don&apos;t see any errors. In our original ClassBasedForm.js component we initialize our state using a constructor. We no longer need to initialize state in a typical class component, nor do we for hooks! Let’s look at an example. Now in a functional component, we can use hooks to up our game. We can initialize state and the related setter at the beginning of our function. This could potentially eliminate several lines of code for us. Here’s how we would initialize state variables in our new component. What exactly are we doing here? Let’s break down one of the lines above. const: Creates a variable for both our state and the associated state variable setter. email: Initializes and declares our first variable email. setEmail: Initializes the setter function associated with the variable email. Though it may seem redundant useState is only intended to be used for a single value. useState(‘’): Declares that the variable email starts as an empty string. If you jump back to your browser, the app should look the same as it did when you ran npm start. Now let’s revise our functions to utilize Hooks. With hooks, we no longer need this or this.setState() since we’re already initiating our state variables and attaching a setter. Since we only have two variables we’re using, we’re going to use an inline function to call the setter that we initiated in useState for each input. We’ll also add our value back without the this prefix.  If we had several variables and wanted to share them between components, we would use an additional hook that we&apos;ll cover in a later article. Now let’s rewrite our handleSubmit function. Tip! In React 16, if you write this as an arrow function, you won&apos;t need to bind it in the constructor. We now need to create a const for the function. We again prevent the default functionality, set the variables, and console.log them. 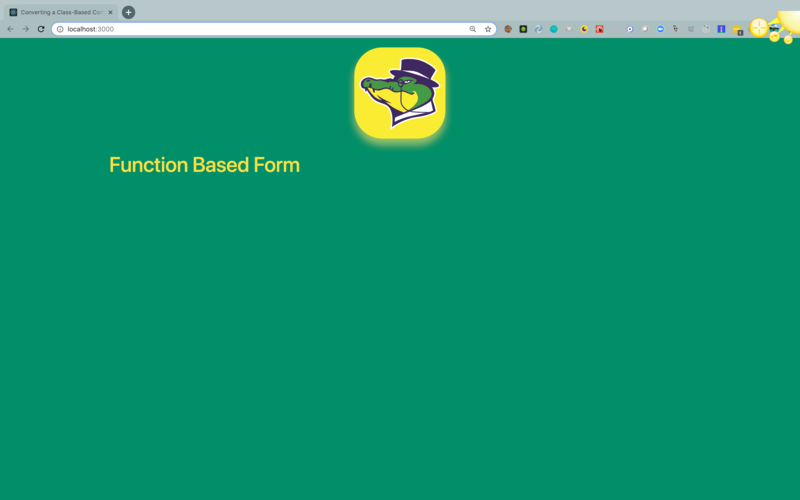 Now we can add our handleSubmit function to the onSubmit in our form.  useState is one of many Hooks we&apos;ll be covering, so stay tuned!